The working of the cache is based on the principle of locality which has two aspects. address is highly probable to be accessed within a short period of time. likely that it will be referenced again within a short period of time. locality is shown by the reuse of the loop variable 100 times in For loop instruction. between main memory and cache, four important cache functions need to be defined. Control logic is further divided into two parts. parts of the address and to evaluate hit or miss. 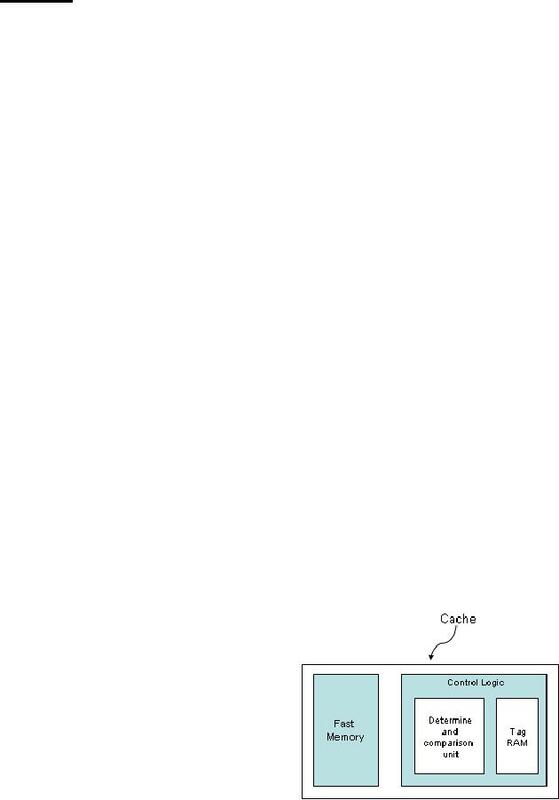 additional bits used by the cache management logic. frequently accessed by the CPU. number, referred to as a tag, which is stored inside a separate tag memory in the cache. verify whether the information in the corresponding block is valid or not. Main memory address references have two fields. · The tag field which must be compared against every tag in the tag memory. Refer to Book Ch.7 Section (7.5) Figure 7.31(page 350-351) for detailed explanation. For details refer to book Ch.7, Section 7.5, Figure 7.32 (Page 351-352). location into the cache memory. It relies on principle of locality. Valid bit specifies that the information in the selected block is valid. Logic design for the direct mapping is simpler as compared to the associative mapping. Only one tag entry needs to be compared with the part of the address called group field. For details refer to the book Ch. 7, Section 7.5, Figure 7.34 (Page 353-354). The size of the main memory is 1 MB. Therefore 20 address bits needs to be specified. for the cache. The remaining 7 bits will be the width of the tag memory. the cache. Total number of cache entries will be 1024 each of 8 bytes. map Cache imposes a considerable amount of rigidity on cache organization. the same as that of the direct-mapped cache. memory. Different methods can be used to select a cache block for replacement. needs replacement called always replacement. there are two options to decide which block is to be replaced. recent past, is replaced with a new block. the cache requires writing into the main memory also. · Read misses never result in writes to the lower level. lower level; useful when using multi processors. and keep the main memory updated. writing back the blocks on replacement. occur in parallel with the write as is the case in read, therefore write takes longer time. execution with the memory update. On a cache miss, there are two options for writing. will be captured by the cache. to that block still have to go to the lower level.